Every year, just as the rest of the nation winds down from the U.S. 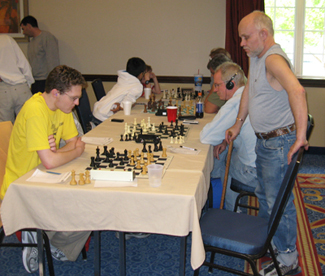 Amateur Team Championships, their neighbors in the Corn Belt are preparing for the annual Midwest Open Team Chess Festival, known as MOTCF (maht-sif). My experience at this year's MOTCF-held in Columbus, Ohio over May 17-18-featured a skittles game that erupted into a Nerf gun fight, a loss by my all-youngster team to "Four Old Men", and a strange encounter with a mysterious group of furry creatures who called themselves the Morphicons. For those who haven't heard of MOTCF before, it is a traditional team tournament which has been held annually since 1963. Unlike the U.S. Amateur Team Championships, there is no average rating cap for teams. This often leads to fierce competition between all-master teams in the final rounds, but the absence of "Goldin Guys"-GM Alexander Goldin's team, which has been the preeminent top seed in past years-and a handful of other strong teams left only one master team, Ohio Chess Cavaliers, free to clean house. The Cavaliers, spearheaded by Ohio Champion NM Carl Boor, finished with 4.5/5.0 to take clear first. The "Ohio Chess Cavaliers". 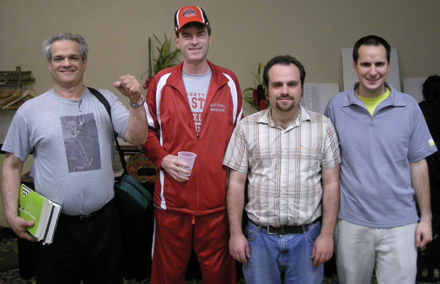 Top seed Boor is third from the left. My own MOTCF team was comprised of the Ohio Elementary Champion, John Lodger Hughes; the Ohio Middle School Champion, NE Michael Vilenchuk; myself, the Ohio High School Champion; and American All-Star member NE Srikar Varadaraj. On the Friday night before the tournament, the four of us got together for a chess party at the Hughes' house. We ordered out for pizza, but we got so involved analyzing a line in the Vienna Game that when the pizza arrived we forgot all about it for at least an hour! Luckily John's dad was able to keep it warm in the oven until at long last we finally had to eat. Not all of our time was spent studying chess and playing bughouse, however. Srikar discovered John's set of Nerf guns on Saturday morning about an hour and a half before the scheduled start of the first round, and the two of them commenced shooting at me with the Styrofoam darts while I was downing one of Mr. Hughes' finest turkey-bacon omelets. Leaving my plate unfinished, I dodged around the nearest corner. I seized a Nerf gun and a handful of the pink fluffy darts and soon was plotting a retaliatory strike. In the hour-long tactical fray that ensued, I used classic chess-warfare understanding to outsmart my younger, less experienced opponents-overprotection (stay covered by fortresses on three or more sides), overloading (cram that Nerf gun until it is completely full! ), prophylaxis (hide their Nerf darts before they can reload), strategic maneuvering against flank weaknesses (I think both Srikar and John were ticklish when the darts bounced off their sides), and effective use of outposts (maintain a strong position at all times!). Of course, being a good shot also helps. I defeated the John-Srikar alliance by a score of 10-3. John Lodger Hughes-determined to achieve victory by any means! NE Srikar Varadaraj. Is this a Nerf-war surrender? Despite my deep understanding of Nerf warfare, I went 0.5/3.0 in Saturday's games. The rest of the team managed to carry my performance for the first two rounds, after which we were 2-0, but from there we encountered difficulties. Our team name, "No Mercy for Old Men"-yet another team name playing on the hit movie "No Country for Old Men"-allowed us to topple the strong team "Senile Dementia" in Round 2, but had no provision in it as to how we ought to handle the team of recent college graduates we took on in Round 3. "Leko My ECO", led by NM Anath Pappu, scored a crushing 3-1 victory us, breaking our momentum. After that battle, our team unanimously agreed to rename ourselves "No Mercy for Anyone" for 2009. On Sunday morning we faced our true challenge, the team "Know Kann? Try Four Old Men". This group of aging old-timers was determined to put us in our place by holding us to a team draw. When my opponent, NM Chuck Diebert, offered me a draw early on despite having the White pieces, I declared loudly "No Mercy!" and fought on to achieve the first win of the match. 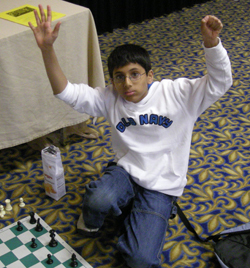 On Board 3, however, NE James Weithoff took out Srikar, leveling the playing field at 1-1. On Board 4, John managed a draw against NE John Hayes, leaving all the action down to a queen-and-pawn time-pressure grudge-match endgame between a determined Michael Vilenchuk and NE John Bath. Michael, determined to defeat his share of the Four Old Men, had sacrificed a full pawn in a drawish queen-and-pawn endgame to gain some chances of promoting a pawn. 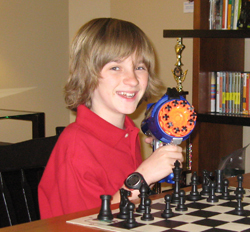 As the spectators gathered around and excitement built, his pawn crept all the way up the board to the seventh rank. Suddenly, Bath brutally secured the queening square for his own h-pawn, which he had stealthily begun advancing without attracting much attention (this was time pressure, after all) and forced immediate resignation. Although it was a crushing blow to be defeated by Four Old Men, our team played the match with tremendous spirit and did indeed show no mercy-to the best of our current abilities. "No Mercy for Old Men" faces its toughest challenge. Besides the normal quirks of team tournament play, this year's MOTCF had one particularly unusual feature. A group of furry creatures known as the Morphicons was holding a convention just down the hall from the tournament room. These young men and women dress wearing animal tails and large floppy, furry ears and dance with great energy and spirit to loud disco music. Around midnight on Saturday night, during my game with NM Ananth Pappu, I passed a room full of Morphicons on my way to the restroom. Curious, I ventured into the darkness, seeing by the harsh multicolored disco lights. "Come on in!" the DJ at the mixing board in the back exclaimed. I hesitated. A tall Morphicon dressed from head to toe in a rabbit mascot suit approached me, looming overhead. Unsure of what to say to the creature, I started to murmur. "I'm still playing a chess game right now-this looks fun-I'll maybe come back after the game is finished-I need to make sure I don't lose it first..." He reached over and patted my shoulder with his large, furry paw. Slowly, I backed out of the room-and ran for dear life once I was back in a fully lit hallway. Chief TD and MOTCF organizer Grant Perks did a little research on the Internet about the Morphicons, but to little avail. Determined not to allow the furry creatures near our beloved chess games, a sign was posted just past the restrooms closest to the playing hall. This year's MOTCF, the 45th ever, was exciting, quirky, and well-run. I'm already looking forward to next year, when there will undoubtedly be an all-youngster team strong enough to beat the experience and wisdom of the Four Old Men. Right to left: NE Michael Vilenchuk, NE Srikar Varadaraj, NM Jonathan Hilton.